MSR-Electronic: The EN 50545 as a central element of gas monitoring in garages and tunnels demands a number of conditions for gas alarm systems. The gases CO, NO and NO2, to be monitored with the help of sensors, are herein defined. In addition to the type of warning message, SIL monitoring is also required for the EN 50271 as referred to in the EN 50545. MSR-Electronic, however, with its guiding principle „Safety First“ has found some safety gaps in the EN 50545 that have to be closed. Even though warning devices are required and the ways in which they have to be present are defined, however, no monitoring of functionality is required. It may therefore be the case that a gas alarm stays undetected, because the warning devices failed, were disconnected or were destroyed unnoticed. This is where MSR-Electronic intervenes with its MSB2-ES module, which monitors the implemented warning devices for functionality and wire break even in the switched-off state and immediately sounds the alarm should one fail. Furthermore, the module is connected to the safe SIL2 bus in the system. Another topic of the actuator technology are the ventilation control systems. These are currently not standardized and not functionally monitored. In addition, there is no requirement in EN 50545 for monitoring of the actuators in case of emergency. MSR-Electronic goes one step further with special motor control modules (MotorModules) that have secure SIL2 communication, are standardized and easy to install. So there is no need for PLC programming here. The modules only have to be parameterized in the central unit (MotorControlModules) via a predefined matrix and can thus be adapted to any type of motor. By standardizing the modules high wiring savings can be achieved in the switch cabinet, enabling considerable cost savings. Until now the transmission of fire alarms had to go the path of direct analog connection to the control systems. With the new MSR-Electronic fire detection modules (FireDetectionModules) the fire alarms from the zones can be collected and handled digitally by SIL2 communication and forwarded to and managed by the controllers. On the one hand the fire alarms can collectively be switched to a fire alarm module (FireDetectionModule) and on the other hand also directly to the engine modules. This increases the flexibility in system design in a secure framework. In order to perfect the integration of the system, the fire brigade control panel for direct control of the ventilation system by the fire brigade, can be included with the tableau module (FireControlModule) into the secure system. Here, too, the transmission takes place via SIL2 certified communication, making it safe and reliable. 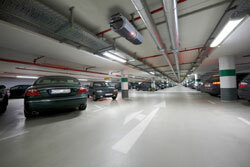 For garages, MSR-Electronic differentiates between three main types. The small garage, middle-sized garage and the large garage. The small garages essentially consist of three components. The gas alarm system, the switch cabinet and finally the ventilation system. The planning phase is complex and very long, in addition a very high level of know-how is demanded from the switch cabinet engineer. This makes the system expensive and error-prone. Small systems with PolyGard-ES have the great advantage that the control unit is equipped with the MSR-Electronic motor control, which makes the planning phase easier and faster. For switch cabinet engineers no special know-how is required anymore! The system is modularly standardized and can be customized at any time without programming effort. This means that it is cheaper but at the same time safer (SIL communication). Medium-sized and large systems can be extended by a fire alarm system and/or a fire control tableau. In addition, the logic can then become more complex as shown in the image below. With the logic module these complex data can be easily collected and processed, thereby considerably facilitating the work between systems. The ES system offers a comfortable possibility to meet all aspects of the garage. This includes the easy parameterization without programming knowledge as well as the modular and future-proof design. With its modular structure in a safe and defined framework, MSR-Electronic provides a safe and certified system that can be adapted to many conditions. The error rate is also significantly reduced by self-monitoring.